Plans to expand Bristol’s Cribbs Causeway shopping centre will cost Weston’s economy millions of pounds, according to MP John Penrose. How would a Cribbs Causeway expansion affect Weston? An expanded Cribbs Causeway could cost Weston’s businesses £39million, or 8.9 per cent of trade. The £45million Dolphin Square project is drawing to a close, and John Penrose fears a Cribbs Causeway expansion could undermine its success. Mr Penrose also believes it could damage the town’s ability to lure big-name retailers. He believes the 50 per cent expansion of the retail complex will ‘sap trade away’ from Weston, making the town’s ‘economic rebirth a lot harder to achieve’. The £300million expansion was approved by South Gloucestershire Council last year, but outcry from business leaders and politicians elsewhere in the South West prompted the plans to be called in for review by the Government’s Planning Inspectorate (PI). 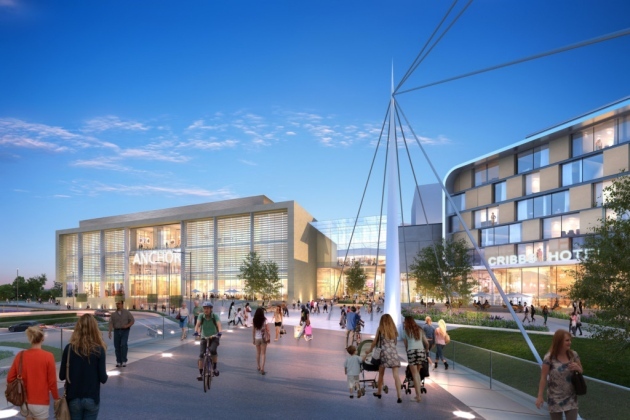 Almost nine per cent of Weston’s trade, equating to £39million, will be lost if the development is approved, Cabot Circus shopping centre owner Bristol Alliance reports. The MP believes Weston’s regeneration, which has seen revamps of the Italian Gardens, Dolphin Square and the Winter Gardens recently, will be undermined if the expansion of Cribbs is approved – making it even harder to entice businesses to the town. Mr Penrose has made his concerns known in a letter to the PI and communities secretary Sajid Javid ahead of the upcoming public inquiry. He said: “North Somerset Council, local businesses and many others have put in huge amounts of work to draw investment to our town and attract new visitors as part of Weston’s regeneration. “Just last week I was speaking with optimistic businesses which are setting up in Dolphin Square, bringing with them not only employment opportunities, but fun things to do for local people and visitors. “With more families moving to Weston, we need this kind of investment to make our town more balanced and sustainable. Chairman of Weston Business Improvement District Paul Batts believes an expansion of Cribbs could harm the town’s growth. He said: “Weston’s developing so well at the moment, but we still need a few more things to happen. It would be detrimental; we want more people to spend money locally.